Does multispectral imaging technology reveal what lies beneath the world's most famous face? The Mona Lisa’s smile has mesmerized the world for centuries. Her beguiling expression and mysterious identity has lead to much speculation and analysis. More recent analysis, carried out by French scientist Pascal Cotte over a 10 year period, uncovered an interesting discovery: a hidden painting underneath. Using the ‘Layer Amplification Method’ (LAM), which Cotte pioneered himself, he projected intense light beams at the painting and measured the reflections at varying wavelengths. 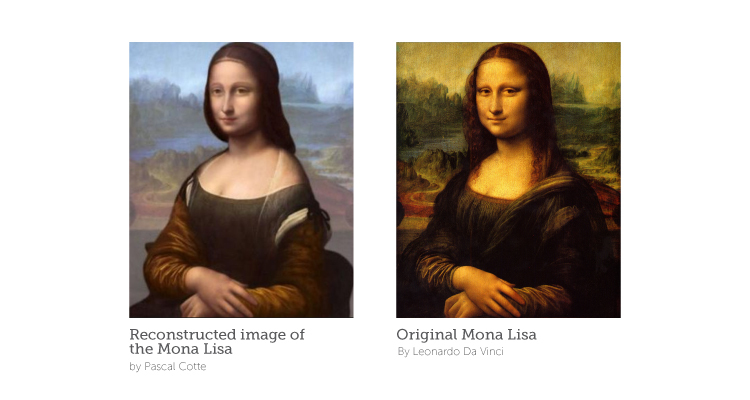 This technique, which reflects elements of multispectral imaging, has enabled Cotte to distinguish details between the various layers of paint and reconstruct what he thinks is the real painting underneath, what he calls ‘the real Lisa’. His discovery made considerable waves in the news, with it being touted as “one of the stories of the century.” But a new imaging technique does not guarantee definitive answers. It depends on the applications, and Cotte’s claims have been met with criticism. Will Gompertz, an arts editor, told the BBC that, “The data that the technology generates is open to interpretation, which needs to be analysed and corroborated by the academic and curatorial community, and not just an individual. I think the Louvre’s decision not to make a comment is telling.” The ‘technology’ that Gompertz refers to is primarily that of ‘multispectral imaging’, and is used in many other industries, albeit for much different reasons. Imagine reading The Odyssey, but all the letters you can understand are l, y and r. You would have some information, but it would be so incomplete as to be almost useless. When you think about part of the electromagnetic spectrum that is actually visible to humans, the comparison is similar. 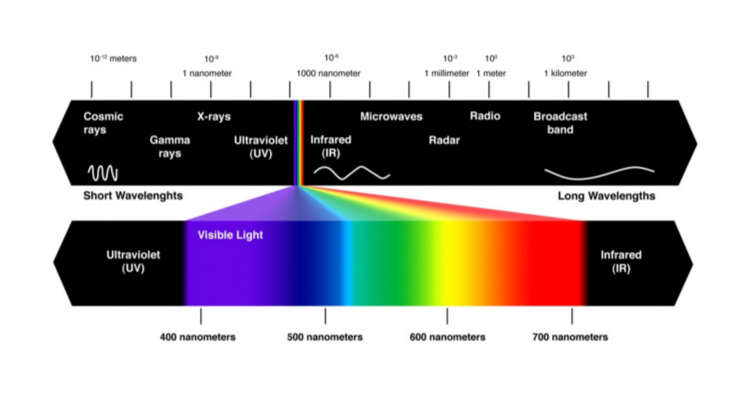 That little sliver between UV (Ultraviolet) and IR (Infrared), is what’s called the ‘Visible Spectrum’, and can be measured as wavelengths between 380 and 780 nanometers. The rest, commonly referred to as ‘spectral bands’ cannot be detected by the human eye. As technology advances, we continue to harness the other spectral bands in various ways for imaging applications. Radio telescopes are able to help map objects and energy in space by detecting radio waves, which pass relatively easily through our atmosphere. Another example is X-ray, which is a frequency that can pass through soft tissues, but bounces off bone, making it ideal for skeletal imaging. False colour composites use both colours within the visible spectrum and those found outside of it like near-infrared, ultraviolet and X-ray. This combination is used in a variety of imaging devices, but its most common use is in satellite imaging. 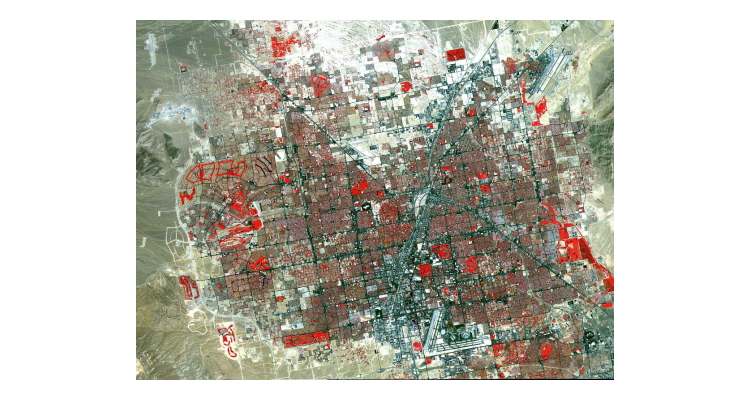 An example can be seen below of a false-colour composite of Las Vegas. Image courtesy NASA/GSFC/MITI/ERSDAC/JAROS, and U.S./Japan ASTER Science Team. In the picture above, three spectral bands are used: red and green from the visible spectrum, and near-infrared, from the non-visible spectrum. This combination is ideal for detecting vegetation, which appears as red, because it reflects near-infrared light very prominently. It can also help geologists assess the health of different landmasses with shots taken from satellites like the Landstat 8, as well as be used for reconnaissance by the military. The degree to which certain substances reflect spectral bands is what’s called their spectral reflectance signature, and different spectral bands are used depending on which object or landscape is being observed. "The Horsehead Nebula IC434" by Rawastrodata, and "Hubble Sees a Horsehead of a Different Color" by ESA/Hubble. Cotte’s use of multispectral imaging, although fairly recent and uncommon, isn’t without precedent. A team of researchers used a similar method to uncover hidden information on a 500 year old map that was said to guide Columbus on his famous journey to the New World, and British scientists have also used multispectral imaging data from satellites to study coastal archaeological sites. Multispectral vision technology has the potential to permeate other industries, and has recently been employed in food production facilities where it has been used to assess the microbiological quality of meat. It is also being used as a way to assess the health of seeds, which could be of immense value to the agricultural industry. The expanded use of this technology could lead to more and more revelations in a variety of industries. Although people aren’t completely sold on Cotte’s discovery, it’s potential to uncover the artistic process of famous artists via the multiple layers of their paintings, could be a revelation in its own right.